Industrial properties or land with industrial potential in Selangor / WP. This is vacant agriculture land and located off the western side ( 2nd layer lot ) of Jalan Tanjong Malim - Slim River main road. It is about 4 km north of Tanjong Malim town. The subject property is zoned industrial under the Draft Local Plan. The land is located 2 km off the Rawang - Ijok main road. It is about 4 km after exiting the Rawang Interchange and about 500 metres after the Kundang junction. The 2 km access off the main road is laterite road but there are many factories along this road. Electricity ( 3-phase ) and water is available. This is an industrial land situated at Jeram, Jalan kapar. It is located next to a public listed company. The land is flat. The subject property is located near to Sunway Industrial Park. It is just the 2nd lot off the New Pantai Expressway. Access is from the New Pantai Expressway too. Even from the other side of the highway, there is an underpass to turn into the land. RM 14 p.s.f. The subject property comprises 3 adjoining agriculture lots. The land is flat and situated in an industrial zone. There are numerous factories in the vicinity. It is about 1 km of the Bukit Beruntung - Sg Choh main road (legal access). It is also next to a railway line. RM 32 p.s.f. This 2 lots adjoining industrial lot is situated next to Rawang Integrated Industrial Park. It is about 1.5 km from the Rawang Interchange. The land is flat and in the vicinity of reputable companies. Looks like cheaper than comparable industrial lot nearby. This industrial lot is situated inside Taman Velox, and industrial park opposite Rawang's Country Home. Taman Velox consist of residential units and industrial lots. The land is flat and slightly above the road. It is possible to buy 2 adjoining lots here making it 170,000 s.f. or 3.9 acres. RM 12 p.s.f. The subject property is located at Serendah, Rawang. It is accessible from the KKB - Rawang trunk road near the Double Track Railway station. Two of the lots are adjoining and the 3rd lot is separated by TNB land. These are new leasehold land with balance of about 88 years remaining. (negotiable) The land is located along the 14th mile of Jalan Puchong. It is located on the left side of the highway if one is coming from IOI mall towards Shah Alam. It is situated behind the yet-to-be built Petronas petrol station. The title's express condition is for "Petrol station and services". Based on the surrounding, it is most suited for workshops and service station. The land has another road access from the back. Located in Sungai Buloh within Taman Desa Aman. The original land area is 4 acres and the factory has a built-up of about 42,000 s.f. Neighbouring lots are all factories. Getting workers here is easy. The building that house the factory and office is still very new. Approved for industrial. Premium of less than RM300,000 to be paid by buyer. The subject property is currently agriculture in status but approved for industrial usage. Premium is about to be paid by the owner. Therefore the price is still negotiable. The subject property is located in section 51 of Petaling Jaya, which is an industrial area. The property faces the Federal Highway, thus can has a very visible frontage. However, access to the property is through Jalan Templer and then onto one of the many road leading to the property. The owner intend to sell and lease back the property for 3 to 5 years. The subject properties are two elongated adjoining industrial lots between Sungai Dua and Karak town. It is next to an existing timber factory by the name of Innovest Timber. The combined road frontage is about 110 feet. The properties can be sold separately. The valuation report dated February 2004 states the market value at $459,000 per acre. 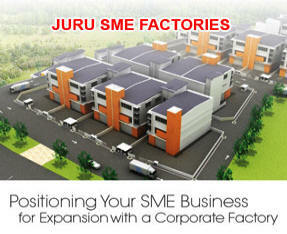 The subject property is located in a vicinity with many factories. It is located off Jalan Bukit Kemuning, behind a factory named Tatsumari (M) Sdn Bhd and next to another by the name of Union Sangkyo (M) Sdn Bhd. There is a transmission cable cutting across one corner of the land. Currently the last 100 feet of access to the land has not been made out yet. Among the reputable factories in the very vicinity are Hunter Douglas and the Alpines Industrial Park. Located in Dato Onn Industrial Park, Tampoi, Johor. The land is flat but the back portion of the land is lower than the access road. However, all the lots along the same row as the subject property is also sharing the same terrain. The leasehold is for 60 years and will be expiring in 2046. RM 13 p.s.f. The subject property comprises 3 rectangular lot. The land is located at the northern fringes of Rawang town. However it is separated by a railway line therefore access is through another path about 3 km from town. Part of the road (1.6 km) leading to the land is sandy road. At the back of the land is the railway line. It is now an old factory rented out to a third party. Scattered in the vicinity are numerous factories too. Electricity and water is available. RM 15 p.s.f. Located off Jalan Bukit Raja/Batu Tiga Lama. It is near to Lee Rubber but currently no access except through private land. It is next to a subdivided industrial lot. The back of the land faces a railway line. Owner claim there is a proposed road cutting through the land but not implemented yet. The subject property is located off around KM 74 of the Kuala Lumpur - Tanjong Malim trunk road, about 1 km south-west of Kalumpang town. It comprises 2 adjoining industrial lot and is situated just after a railway line. Just before the railway lines is a partially constructed housing scheme. Access to the subject property is along Jalan Sungai Sabai and then turn off onto a laterite (legal) access. A flat piece of land located in Tampoi Industrial estate, Johor. The land is in a mature industrial estate having good access to the Pasir Gudang highway. The subject property is located about 1 km after Ijok town. The land is flat and has been cleared. The land is suitable for housing or warehousing purposes. This area is zoned for housing. This oil palm estate is located in Kluang. It is 8 km after Kluang town along the Kluang-Mersing road. The subject property is surrounding by industrial estate like the Kluang Industrial Estate, the Taman Perindustrian Sinaran, Taman Perindustrian Matahari. There are some housing estate nearby like Taman Puteri. The land is rectangle in shape with the narrow width facing the main road. Facing the land from the main road, the land is slightly tilted from left to right. The neighbour is an existing factory. The title did not specify the category of usage but the land is zoned for industrial use. (ono) The subject property is located within Panchor Jaya industrial estate. The land is just being cleared and infrastructure should be ready soon. The housing estate of Panchor Jaya is well established. Both the lots of 1 acre and half acre are adjoining. Leasehold 99 years expiring 2096. Next to Bukit Serdang Industrial Zone. Currently rubber land. Just around 900 metres from existing terrace factory. Electricity available. Infrastructure-ready industrial lot in the middle of West Port. Industrial zoning. Access by tar road. Water and electricity available. Located within the oil and gas industrial area in Kerteh. Zoning is industrial. Kertih Airport, the proposed new road by passing Kertih town and the small and medium sized industrial site proposed by SEDC Trengganu are located next to the subject property. Other project in the vicinity are: PVC and VCM plants by Petronas and Land and General/Mitsui. The subject property has several hills with earth amounting to 2 million cubic meters. This property is the the only parcel of land which is hilly and the surrounding land (not part of the subject property) are generally low lying and requiring filling.